This post is sponsored by Bounty. We are being compensated to help spread the word about Bounty's 50th Anniversary, but Pawsitively Pets only shares information we feel is relevant to our readers. All opinions expressed here are our own. Bounty is not responsible for the content of this article. As Bounty celebrates their 50th anniversary as America's favorite Quicker Picker Upper, I too would like to celebrate by remembering my messes and fun from over the years. 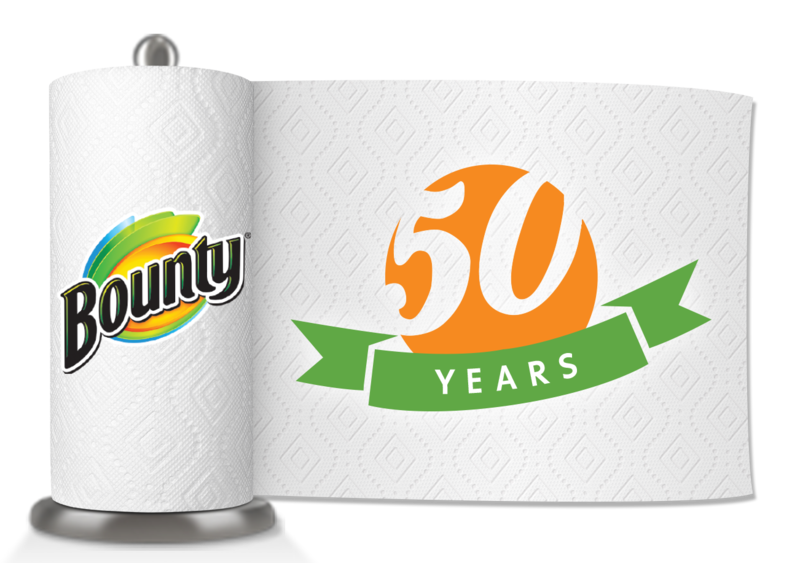 Bounty has been around since 1965 and since then has consistently delivered paper towels with superior absorbency and strength to American households. As a child, having fun was all about making messes. My mom was a big cleaner and she was always following my brother and I around cleaning up any disasters we created. 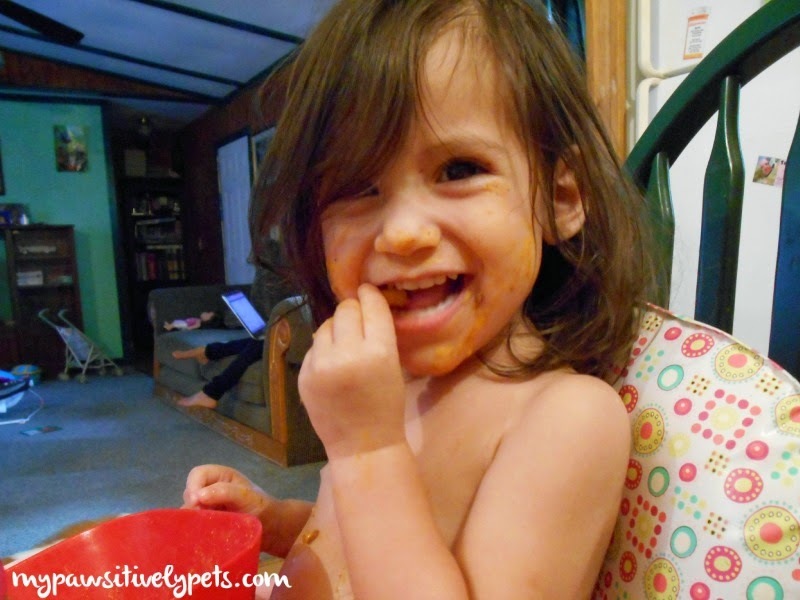 Still, she realized the fun in making messes and getting messy so she regularly let us help her in the kitchen, dig in the dirt, and eat messy foods. We used to bake cupcakes and sell them for a quarter to customers at our family nursery. It was always a lot of fun and we got to lick the mixer beaters and bowl of batter afterwards. One of the things I admire about my mom is that she always let us do all of this messy stuff and didn't complain about the mess we were making. She just let us have our fun and then cleaned us up afterwards. 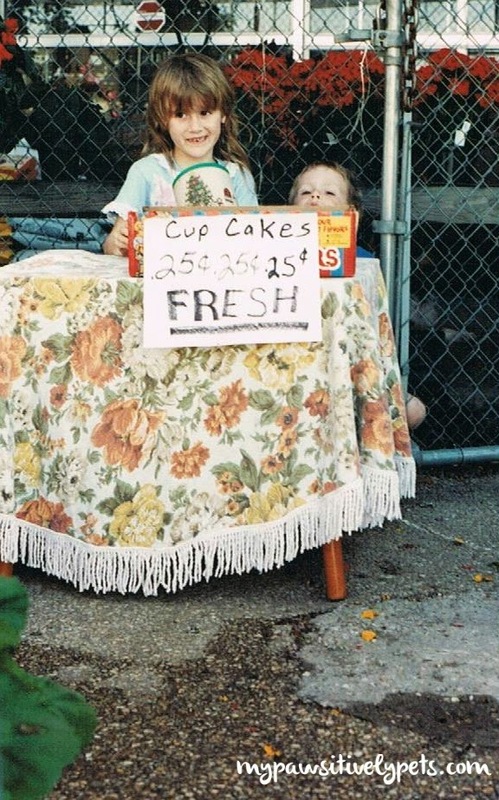 My brother and I selling cupcakes. Not only did my mom have my brother and I to clean up after, but we always had a variety of pets as well. We always had one dog, a cat or two, and maybe a hamster or some other odd creature. 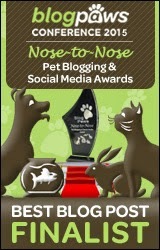 If you're a pet parent, and most of you reading this probably are, you know that pets can be messy! 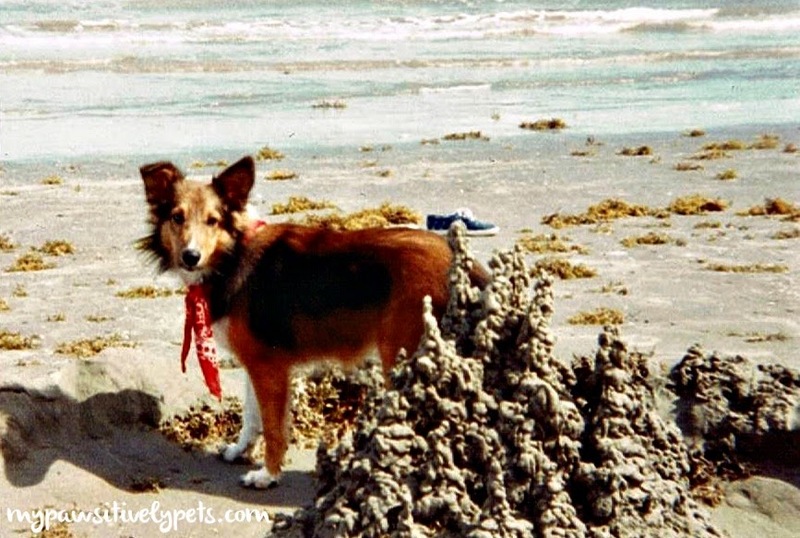 When I was in the third grade, our family got a new Shetland Sheepdog puppy and we named her Jenny. Now, Jenny was an excellent dog and almost never got into trouble as an adult. As a puppy... well, that's a different story. I remember Jenny used to strew rolls of toilet paper all over the house while we were gone. Sometimes, she would get into the trash can and make a big mess in the kitchen. Once, she even pulled our Thanksgiving turkey carcass out of the trash and drug it underneath my bed. As an adult, I have my own family and I now face the woes of cleaning up after them on a regular basis. It's hard work - let me tell you! I have my own two human children that love to get messy. I have a toddler that can make a mess in world record time in the most creative ways possible. 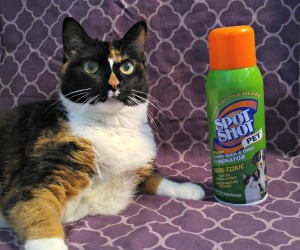 Bounty is always there to help with a quick and painless clean-up. Little kids are messy eaters. My older daughter has thankfully grown out of her messy phase a little bit, but she enjoys being crafty. You know - painting, sculpting, glue and glitter. Her crafts usually involve a bit of clean up afterwards. Bounty paper towels come in very handy for most of her crafts. I also have several furry children - my pets. They like to make messes too! It's hard to name any one of them as "my most messy pet", but because my dog, Shiner, has been with me for the longest amount of time I think she deserves the crown for being messy. 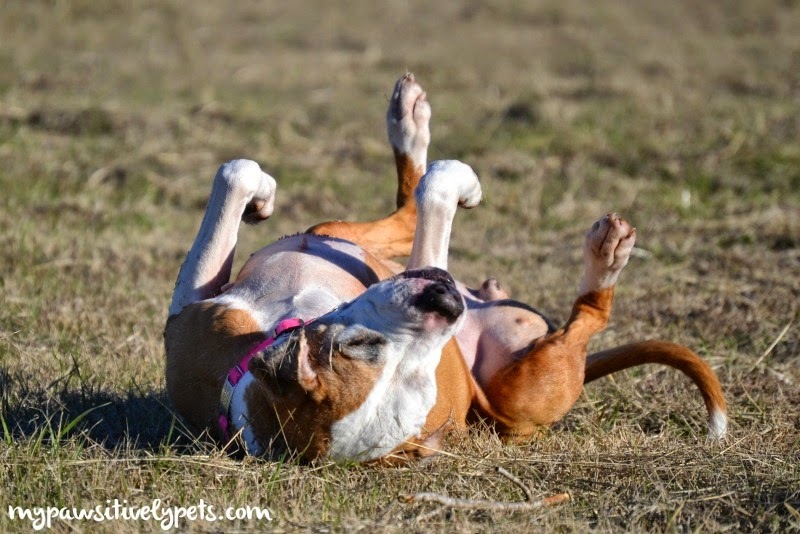 Shiner has rolled in mud pits countless number of times. She's mischievous and a food hound that likes to dig in the trash can and drag the contents all over my house. She has potty accidents every now and then. Sometimes, she throws up on my floor. Shiner is notorious for removing the stuffing from stuffed toys, pillows, and blankets. You get the point. She's a messy dog sometimes! Initially, when these messes happen they might make me feel upset or angry. But truth be told, these are the events in my life that stick with me. They make great memories that I can never forget. I will always look back on all of these messy times and be able to laugh about it. Messes can always be cleaned up easily, but memories will last you a lifetime. For cleaning messes in my house, I have Bounty. Over the years, Bounty has been there for my family to help out with the messes making it possible to have more fun in life! Bounty's superior absorbency and strength is the reason why I trust using it and the reason why it remains America's favorite Quicker Picker Upper. Bounty has always maintained a tradition of excellence and innovation, listening to consumers' needs to develop the best possible paper towels. That is why they are still around today to celebrate their 50th anniversary. So to that I say thank you Bounty for always being there when life gets messy! Without you, making messes and having fun wouldn't be as easy. Bounty helps make my life easier and more enjoyable so I don't need to sweat the small stuff. 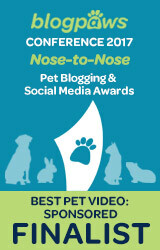 Has your pet or family ever made a big mess in your house? Tell us about it in the comments! Ah, good old Bounty! We always use Bounty at home and when we are camping. You don't know a mess until you have a camping mess of your own making or courtesy of the wildlife. Bounty is always the quicker picker upper! Oh yes - used to go camping as a kid all of the time and they always came in handy then too! 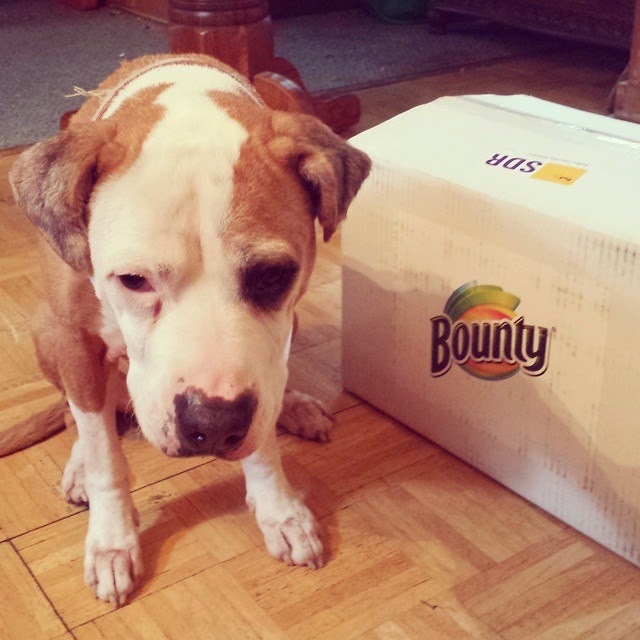 I enjoyed this post because Bounty is actually my favorite paper towels ! Dakota had one poopy mess at least 4 years ago...to this day, I have no idea what happened but I woke up, he was in his crate, and poop was all over the dining room, living room, everywhere! (But it wasn't in his crate).......I was cleaning like a freak. I think it was Cody who did something but I still don't know what! LOL - dogs are capable of amazing and mysterious things sometimes. I'm consistent with certain products and Bounty is certainly one that I purchase religiously. Great post, loved learning more about you Ann. All the photos were adorable also. We aren't a Bounty user and we try to limit use of paper towels and use old towels instead. Still, it is interesting to think Bounty is fifty years old. What a great post....you really found a fun way to review paper towels! :) Those are really great memories. With 5 pets in the house I'd be completely lost without paper towels. Bounty is such a household name, and I can't believe they've been around for that long! We've made more messes in this house than the mom wants to think about! The mom is a huge Bounty fan...she uses Bounty paper towels all the time. We love paper towels... great for pet mess and other messes too! We make a lot of messes in my house, and I can't blame it on the kids. Paper towels are a great way to clean them up. Nice old reliable Bounty - we get a lot of use out of it here as well. Although Laika is generally pretty clean she's been getting into a lot of mud lately (oh the joys of Spring) and like Shiner she also throws up on the carpet from time to time. Silly dogs. When Carmine was a kitten, he loved to unroll toilet paper rolls! Your childhood memories of cooking and selling cupcakes sound like a lot of fun! oh man..Jada pukes every once in a while and I used paper towels to clean it up. You have to have good thick paper towels like Bounty, otherwise it will take forever and even seep through to your fingers when you pick it up. Barf! No joke - today Matt wiped something off the counter with a paper towel and he said "I feel like I was just on a Bounty commercial! The quicker picker upper..."
We go through paper towels so quickly in our house! All of the messes are memories! I love this post! We don't use paper towels in our house, so I get to see all the stains on the towels as memories of past messes! HA!